Health & Safety Consultants servicing Bolton, the North West and the whole of the UK. TL Safety Ltd provide health and safety, quality, ISO, CE marking and EN 1090 consultancy services. We can provide employment law and HR consultancy services and safety training. We support architectural practices, designers, builders, contractors, estate managers, facility managers, retailers, manufacturers, fabricators, service organisations, maintainers, warehouses, schools, colleges, office managers, local authorities and all types of organisations. We can act as your "Competent Health and Safety Advisor" or simply carry out ad hoc services "as and when" required. We use TL Safety to help us manage our ISO systems particularly with regard to internal audits. We have always found them extremely thorough and provide constructive and helpful advice to improve these aspects of running the business. We have also recently booked Fire Marshal courses for some of our employees and those that have been on it have said how good it was. Recently We (Style Movable Wall Specialists) employed TL Safety services to carry out a H&S site inspection with one of our installation teams. Our team were not informed on the day of the visit so a true reflection of where we are as a business could be achieved. Both parties challenged the inspection in a very professional manner with great dialogue and interaction. The outcome was very positive and reflects our understanding and implementation of H&S through our processes. Tony @ TL Safety gave us assistance in achieving our BS EN 1090 C E Marking status. Without his help we would have struggled with the amount of new information that was thrust upon us. His guidance and advice was immeasurable and we cannot thank him enough. His professionalism was unfounded and we cannot think of a better company to help your Health and Safety or Certification needs. ​The Abbey Group did not know how to begin the process for CE approval. Not really having any idea were to begin we contacted Tony from TL Safety. Tony fully informed Abbey how to begin the process. TL Safety were in contact every step of the way, even replying to queries we had out of office hours. With the help of Tony and TL Safety we are now well underway on our journey for CE approval. ​It is coming up to 12 Months since we appointed TL safety to provide advice and training, we have not been disappointed. TL approach is pro active with an accent on prevention. The Style Moveable wall Group had good H and S systems in place and a good general culture, but maintaining this at the right level is very time consuming for the regional Directors and management. TL now carry the burden, in respect of updates, legislation, cascading information to the workforce and providing good commonsense advice to anyone at any level in the organisation. We appointed TL Safety as consultants for our ISO 9001 and BS EN1090 application and are both extremely pleased and proud to announce that we passed both on our first stage 2 audit. The advice that TL Safety provided was second to none; our manuals are professional and user friendly and the in-depth knowledge our personal consultant had on both accreditation's was outstanding. We couldn't have made a better choice using TL Safety and won't hesitate to use them for any further requirements. A fantastic end to 2016! ​​​West Port Timber Windows and doors requested TL Safety to provide both onsite and offsite assistance and training for West Port to successfully achieve transition to ISO 9001-2015 quality system. The work carried out on our control manual, management review, action plans and internal audits along with being present on the day of the audit resulted in a smooth transition. We can act as your "Competent Health and Safety Advisor"
TL Safety Ltd specialise in HSE improvement notices and prohibition notices, risk management and risk assessment. We are based in the North West but operate throughout the whole of the United Kingdom. TL Safety Ltd can prepare your safety documentation such as health and safety policies, health and safety arrangements, method statements, construction phase plans, demolition plans and other documentation. We can prepare management systems to meet ISO standards, NHSS standards and factory production control manuals to meet EN 1090 (CE Marking of structural steelwork). 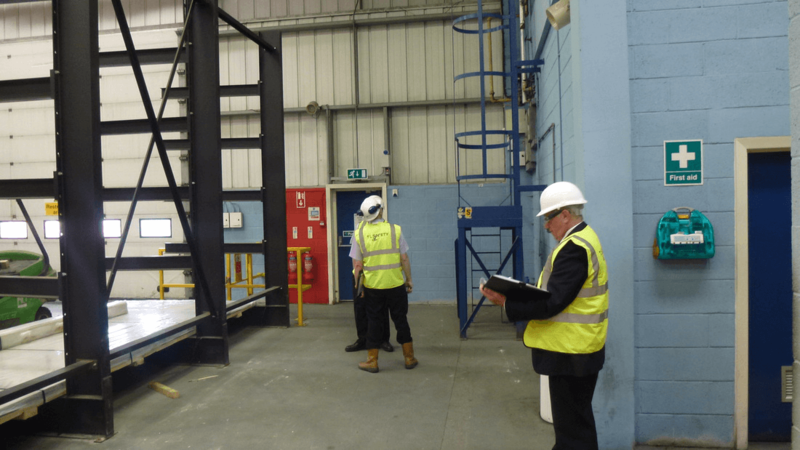 TL Safety Ltd can carry out site or premises inspections, audits of your management systems, health and safety arrangements, general compliance audits or assist with CE marking of machinery. TL Safety Ltd is a family owned business established in 2011 by Tony Lundy who is the Managing Director. Tony is an OSHCR registered health and safety consultant and a chartered manager. ​He has assisted many organisations both locally and nationally to improve occupational health and safety performance as well as installing management systems for ISO 9001, ISO 14001, OHSAS 18001 and BS EN 1090 CE marking of structural steelwork. With over 20 year's experience as health & Safety, quality and environmental director for a principal rail contractor and fabricator he has vast experience in construction, manufacturing, fabrication and the design process. In 2016, Tony was appointed as the construction health and safety advisor for a £40 million new build project of MBDA Missile Systems new offices and manufacturing facilities at Logistics North, Bolton. ​Tony has assisted both multi-national companies and owner managed companies to implement health and safety policy, arrangements, procedures and risk management. He has experience in various industries and is capable of supporting most businesses with their compliance needs.